That said, Fox 2 musters a sense of fun that allows it to succeed. Unlike many Disney DTV sequels, it doesn’t just retell the original flick’s story, and in this case, the plot is superior to that of its predecessor. Granted, that’s not hard to do since Fox lacked much of a narrative, but it comes as a pleasant surprise to find a plot that attempts to step out on its own and not just regurgitate elements from the earlier film. The Fox and the Hound 2 appears in an aspect ratio of approximately 1.78:1 on this Blu-ray Disc. From start to finish, this presentation looked excellent. The movie came with a pretty good DTS-HD MA 5.1 soundtrack. Across the front channels, the sound presented a fairly broad array. Music displayed nice stereo imaging, and elements meshed together well. A fair amount of effects popped up from the sides and movement flowed cleanly. The surrounds added a surprising amount of material as well. Material often popped up from the back speakers, and the components were accurately placed. The whole package blended together to create a strong little soundscape. How did the picture and audio of the Blu-ray compare to that of the original DVD? Sound was a wash, with a little more warmth to the Blu-ray but not a lot. However, the visuals made a good-looking movie even more attractive, as sharpness and vivacity were much stronger. Though the film’s original DVD included a mix of extras, most of these go absent here. In fact, the Blu-ray only provides one movie-specific component: a featurette called Unlikely Friends. It goes for seven minutes, 25 seconds. Most of the content comes from a narrator, but we also get some notes from Professor of Animal Science Gary Wilson. We learn about how different animals get along ala the fox/hound relationship in the movie. It’s a quick but moderately interesting piece. The disc opens with ads for The Lion King, SpookyBuddies: The Curse of the Howlloween Hound, and Dumbo. These also appear under Sneak Peeks along with clips for Bambi II, Tinker Bell and the Mysterious Winter Woods, Tinker Bell and the Pixie Hollow Games, Jake and the Neverland Pirates and Mars Needs Moms. No trailer for Fox 2 shows up here. A second disc provides a DVD Copy of Fox 2. In addition to the film itself, this boasts some extras we don’t find on the Blu-ray. A music video for “You Know I Will” by Lucas Grabeel goes for three minutes, 36 seconds. It combines shots of Grabeel in the studio along with movie clips. Actually, it tries to be cute in that it portrays Grabeel in a number of jobs during the production. That’s a minor attempt to create something clever in an otherwise totally forgettable tune and video. The Making of the Music: The Fox and the Hound 2 runs 10 minutes, seven seconds. It features notes from Grabeel, director Jim Kammerud, music supervisor Kimberly Oliver, Disney Toon Studios Senior VP of Music Matt Walker, composers Marcus Hummon, Joel McNeely, Will Robinson and Gordon Kennedy, musicians Trisha Yearwood, Karen Fairchild and Josh Gracin, and actors Reba McEntire and Jeff Foxworthy. We hear how the filmmakers went to Nashville and found songwriters for the flick. We also get notes about the composition and recording of some tunes as well as the score. Though the show provides a smattering of interesting notes, it remains too superficial to offer much. Perhaps my enjoyment of The Fox and the Hound 2 stems from my lack of affection for its predecessor, or maybe it’s just a decent little flick. Whatever the case, I think the sequel provides a peppy and innocuous piece of fun. The Blu-ray offers excellent visuals and good audio but lacks substantial supplements. No one will mistake Fox 2 for the best Disney has to offer, but it boasts decent charm. 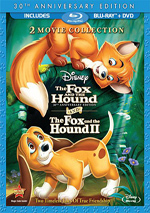 Note that The Fox and the Hound 2 appears only as part of a two-pack with its 1981 theatrical predecessor. Both appear on the same Blu-ray Disc; the package also tosses in standard DVD versions of the two movies.